The Capuchin Franciscan Friars are a Roman Catholic religious order of brothers and priests inspired by the life and ideals of St. Francis of Assisi. Francis was a unique and dynamic individual who lived life with a passion for peace, honesty and charity. While society was turning away from Christian values, Francis embraced the message of Christ and lived simply serving the poor. The Capuchins were founded in 1528 inspired by Francis’ dynamic vision. We came to the United States in the nineteenth century to serve poor immigrants looking for a new life. 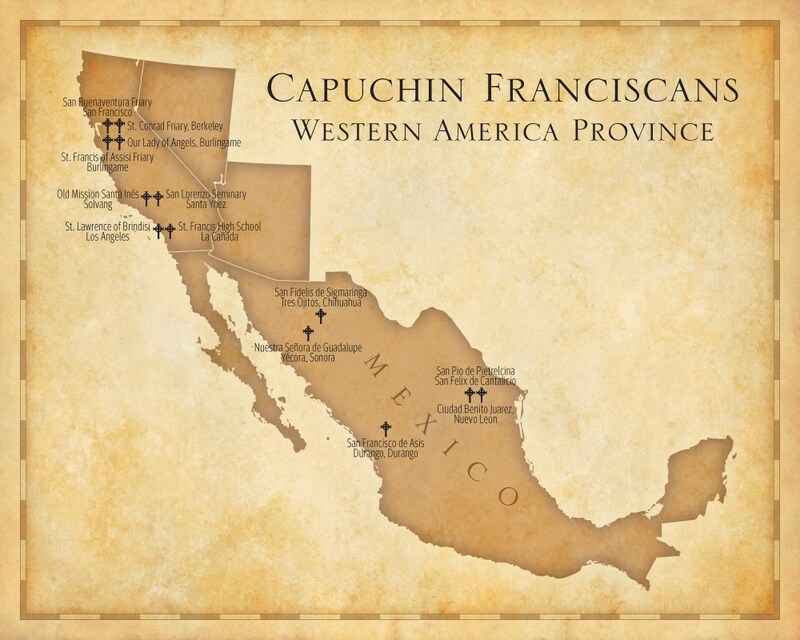 Since then, Capuchin Franciscans have ministered to German, Irish, Italian, and Asian immigrants, Hispanics, Native Americans and African Americans. In America as elsewhere we strive to share our rich heritage of contemplative prayer, preaching the Word of God, and caring for those in need. In this tradition of service, Capuchins find inspiration and hope. Today, the Capuchins serve throughout the world and are one of the largest religious Orders of men in the Church, with about 11,000 members. “Let us strive to give priority to a life of prayer, especially contemplative prayer, to cultivate, together with a spirit of minority, radical poverty, both personal and communal; and, out of love of the Lord’s cross, to manifest a life of austerity and joyful penance… While exercising among ourselves the freedom of brothers, let us joyfully live among the poor, the powerless and the weak, sharing their life, and let us maintain our special approach to people. In many ways, above all in the work of evangelization, let us promote an apostolic dynamism that is carried out in a spirit of service” (CC 1,4). The charism of the Capuchins has taken concrete form in the life and witness of the orders many canonized and beatified members. Several striking commonalities can be observed in the lives of these holy men and women over the course of the last 400 years: centrality of the Eucharist, fervent devotion to the Blessed Virgin Mary, long hours spent in prayer, bodily mortification through penance and humble austerity, and a special affinity and closeness to the common man – especially the poor.